Lowering can be required for a number of reasons. Touching the ground and geometry changes are the two main ones. We have been lowering suspension for over 30 years. In some cases it is as simple as the addition of special spacers in both the forks and shock. In other cases it is quite involved including changing or modifying springs and custom machining. We can lower your suspension whether it's Street, Dirt or ATV. Race Tech offers Suspension Lowering for all rebuildable suspension. Note: some models are not rebuildable. Check our ►Product Search. This is more of a problem on the rear. In this case we may be able to build custom G3-S Series Shocks for you. We normally recommend lowering a motorcycle 25mm (1"). You will be surprised how much of a difference this amount makes. The reason only 25mm is recommended is the loss of ground clearance and travel becomes more of a problem the further you go. However we can lower the motorcycle any amount you want. Keep in mind that the more a bike is lowered the more likely it will be that new springs are required (see below). Some street models are already lowered. On these models further lowering should be confined to show applications as ground clearance and therefore cornering clearance might be a problem. WE DO NOT RECOMMEND LOWERING LINKS! They do nothing to decrease the travel. This means the tire can bottom out through the fender! This has the likely potential to stop the rear wheel from turning and if this happens, it is our belief, can cause a crash. Lowering the suspension is done internally using spacers. In other words we are making the shock and forks shorter. Lowering is reversible so you can return the suspension to stock height if you desire. Keep in mind that shortening the shock by 5mm does not lower the rear end 5mm. This is because of the leverage ratio of the linkage or geometry of the shock mounting. In general most modern dirt bikes have an initial leverage ratio ranging from 3.1 to 4.0. With a 3.1 leverage ratio a 3mm spacer would lower the rear end 3.1 times the 3mm or 9.3mm at the wheel. 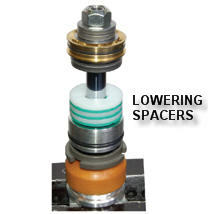 Knowledge of this relationship is critical in making the spacer the proper length. Lowering spacers may be purchased, but they do not come in the form of a kit specific to each model. Lowering spacers should only be installed by an experienced suspension tuner familiar with the entire lowering process. Please contact our sales department for more information 951-279-6655. Shorter springs may be required for the reduced length of the forks and shock. This may be accomplished by modifying the stock springs or by replacement with a ►RT Hi-Performance Spring or even with a modified RT HP Spring. When a spring is shortened it becomes stiffer. When modifying the stock springs this may or may not be beneficial. This will be determined on a specific application basis. We may need to see your shock and forks to find out. We strongly recommend suspension be revalved and resprung for reduced travel with our ►Gold Valves during this process. This will set the valving properly for the decreased travel, for your riding weight, ability, and type of riding. When the rear end is lowered the travel starts deeper into the leverage ratio curve and this affects setup. Note: If the travel is decreased by 20% the stiffness must be increased by 25%. If the travel is decreased by 50% the stuffness must be increased by 100%. Prices: Cost for lowering suspension varies greatly. Some models only need spacers installed while others needs custom machining and springs or spring modifications. Please call for specific pricing 951.279.6655. Please recognize that we will have to see some models before we can give exact pricing.